Mumbai is always on the move! Isn’t it? At least 90% of Mumbaikars hate the hectic nature of the city! And most of them certainly admit that if they could, they’d get out of the city at the first chance they’d get. Every weekend, for folks who want ‘Out’ of the hustle and bustle, are always trying to make a choice on where to go to? Most places are either filled up with the same crowd, or are far off to do a weekend / long weekend. And have been visited to. That’s when I believe one of the top picks for them and even for folks in Pune for that matter, is Mahabaleshwar, Matheran and Panchgani! Considering it was a midweek break, the travel wasn’t that hectic. To add to that, it was receding monsoon, so the weather up there in Panchgani, was most definitely one to cherish! Took the early morning bus from Mumbai, and reached Panchgani around noon! That’s how long it’d take for you to travel to this place. That’s the beauty of it! One of the reasons why I’d decided to visit this place was because of it being a little off beat, surrounded by greenery, vintage yet contemporary and most importantly, the magnificent view that this place had to offer! The garden with a view! It’s really delightful especially for a family weekend getaway, or a bunch of friends. I mean, who wouldn’t want to wake up in a beautiful 2 and a half bedroom villa on the edge of a valley! The first rays of sun if you’re lucky and don’t have any clouds. Or be it the beauty of the sky to fill your day with brightness. It’s a quiet location with a rustic yet modern feel to it, especially with the surrounding greenery, the swing to sit on while enjoying a breathtaking view and listening to the sound of the wind whizz past you across the mountains into the valley. A magical experience, certainly helps a city dweller like me to keep my sanity! A must do once every while for sure. Apart from that the wooden staircase ascends to a charming mezzanine of dark shiny wood that contrasts with the all white interior. The simplistic interiors speak exude elegance. The colourful throw pillows, bedsheets and flower pots add just the required dash of colour making this villa a very welcoming place. Cozy and Comfortable. Just like a second home. Or if you’re sitting with friends/family, this is good too! The best place to have breakfast in the morning. With the weather that was during the time I stayed there, even if it was a midweek and I had a few things that I had to work on, who wouldn’t want to work out a place like this, sipping on a hot cup of coffee! A perfect view and a relaxed mind! Nothing more that I could ask for! Apart from this, the most amazing experience I had at this place was a bonus for me. Especially since I’ve recently took upon the love for organic farming! The local caretaker, Santosh, gave me a tour of the plants/crops he’s already planted in the backyard. But apart from that, he also let me experience farming first hand, much to my delight. Some organic red and green chillies already growing in the backyard. The place on it’s own has a magic to it. The garden, the backyard, the experential organic farming bit, the location with a view and most importantly the quiet and peaceful stay! Quite the experience indeed! Special Note: I was hosted at the Saffron Stays Verandah by the Valley thanks to the guys at Saffron Stays! Apart from the magical experience and the delightful stay, I’ve not got anything in return! In case you want to book the place, you could do it by getting in touch with Saffron Stays. They also have an AirBnB listing, incase you are comfortable booking via AirBnB. 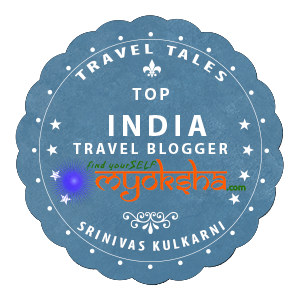 This entry was posted in Travelogues, Stories and Life on October 2, 2016 by srinistuff.